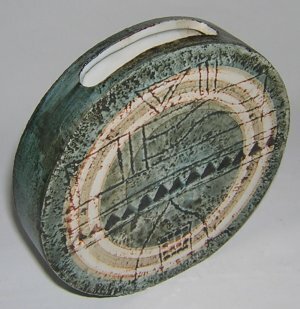 One of the areas we’ve learnt quite a lot about since we started selling pottery online is how to photograph it. I think the photos on our site are reasonably good – clear and sharp on balanced backgrounds – but there’s no doubt a professional studio shot would add a touch of extra class to each one. At more upmarket antiques fairs, it is quite common to see lighting cubes and tents such as these for sale. Although they don’t cost the earth, they aren’t exactly cheap, either – especially once you have bought some lights as well. It’s pretty good, I think. The only time we come across real problems are with pieces that reflect the flashlight from our camera particularly badly. That’s when photo cubes really come into their own. All is not lost, however – I recently came across a simple DIY design for a photocube that shouldn’t cost more than a few pounds. Cynthia Guajardo is a ceramic artist living in Denver, Colorado and has obviously faced exactly the same problems (and budgetary constraints!) that we have. In her blog, she recently provided an overview of her portable light box (or cube) design. Cynthia got here inspiration from a very popular photography blog – Strobist – so see here for more details on how to make the most of this design. It looks like it should work well – used in the sunshine it won’t need additional lighting, and used indoors it should be possible to improvise with interior lighting (especially if you have any halogen lamps) to create the desired effect. We’re going to try creating one of these – for the number of photos we take it should come in handy. Even if you only sell a few things on eBay occassionally, why not give it a try? Professional-looking photography will help give your bidders confidence and present your item as well as possible. This entry was posted in Ceramics photography and tagged ceramics, how to take photographs, light box, light cube, photography on October 8, 2007 by Perfect Pieces.